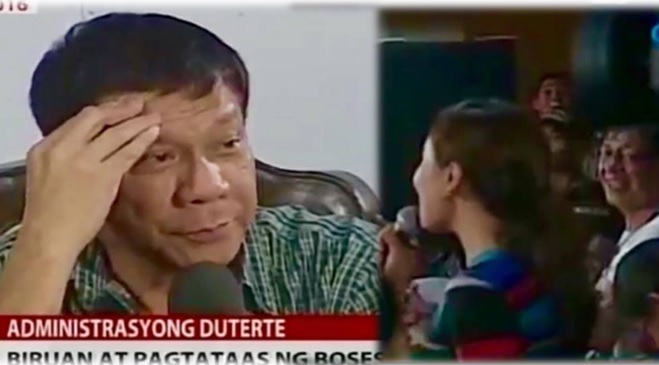 MANILA, Philippines - President-elect Rodrigo Duterte is once again embroiled in another controversy after catcalling GMA news reporter Mariz Umali during a press conference in Davao City on Tuesday, May 31. But instead of answering Umali’s question, Duterte whistled and sang Anthony Castelo’s hit “Kaibigan.” A video of the incident has been making rounds on social media. While many netizens were irked by Duterte’s response to Umali’s question, the Kapuso reporter’s husband Raffy Tima, a news anchor and reporter at GMA News, expressed his dismay over Duterte catcalling his wife. GMA News reporters Mariz Umali and Raffy Tima. According to Tima, he wasn’t shocked with Duterte’s action as he claims he knew the tough talking mayor’s reputation well enough. However, Tima stressed that it does not make Duterte’s action right. “For someone who espouses leadership by example, catcalling anyone in a press conference with all cameras trained on him defies logic. Then again, thats Mayor Duterte,” he wrote. Tima also revealed that he was appalled at the way some people in the room reacted. “Most laughed, others made teasing noise and basically urged the mayor to dish some more! And he did. I do hope none of them were journalists because if they were, shame on them,” Tima added. In her interview with GMA’s State of the Nation, Umali admitted that she felt awkward with Duterte’s response but still insisted that he answer her question. Umali also thanked Tima for defending her. “Admittedly, I was surprised with Pres. Duterte's response to my question. However, I tried to understand him based on what I know about him, kept my composure, and insisted on my answer, which I got,” Umali said.